Tonight begins Project Horror's five days of Occult & Supernatural. I'm looking forward to this, because of the movies that can still put a chill into me, most of them fall into this category. My friends Jarrett and Steve recommended this one. Actually, Jarrett's exact words were, "I watched House of the Devil on Netflix and it was pretty awesome, and it kind of sucked, so take that how you will." With praise like that, how could I resist? I'm going to agree with that assessment, actually. It was a fun movie, but, well... I'll get to that in a minute. 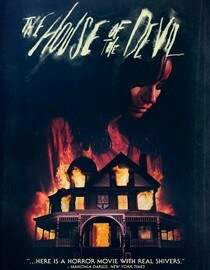 This movie was made just two years ago, but is shot to look like an early '80s horror film - not just the costumes and props, but the actual look of the movie. It's not some ironic touch like in a Tarantino film, either; it's done in earnest. The story is that Samantha, a college girl who badly needs money, accepts a babysitting job at a mansion out in the country on the night of a full lunar eclipse. When she gets there, she finds out that she'll actually be looking after an elderly woman, but needs the money enough that she agrees to stay. The rest of the movie involves her making strange discoveries in the house, and becoming more frightened. SPOILER - At the end, she wakes up from being drugged to find herself lashed to a satanic altar as part of a ritual. I won't give away the ending, but she does escape only for there to be another twist at the end. I give it three goat heads out of five. netflix seems pretty convinced i'm going to like this one, and at this point in our 8-year love affair they've usually got my number. i guess i like middling crap. Nah, give it a shot. It's not going to turn your world upside down or anything, but it's pretty fun for a genre fan. And it's on instant streaming, so it won't even take up a shipping slot.